Upgrading the brake rotors in your FIAT 500 ABARTH or 500T? These rotors are designed to fit the FIAT 500 ABARTH and the FIAT 500T. Please check our other listings for more Tarox brake upgrade options and packages. 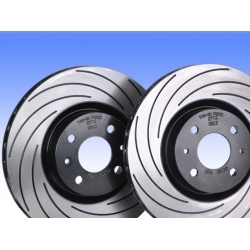 Their Brake Rotors are also recognized as one of the very best performance discs available on the market. Since the early 1980s TAROX brake discs have been associated with absolute quality. Blank casts used for TAROX discs, after having passed stringent quality controls, are subjected to structural stress relieving heat treatment at the end of each machining phase as a result of more than 30 years experience.